Born in Liverpool Canon Tony O’Brien trained for the priesthood at Upholland and Ushaw Seminaries and attended Durham University. He was ordained in 1979 by Archbishop Worlock. 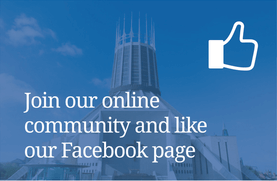 He has served in parishes in Netherton, Skelmersdale and Toxteth within the Archdiocese and following a term as Diocesan Financial Secretary was appointed Dean of the Metropolitan Cathedral in 2005 by Archbishop Kelly. Monsignor Cookson came to the Cathedral as an administrator in 1989 and was responsible for its running for sixteen years until resigning due to ill health. The post offered plenty of scope for his passion for ‘DIY’, and when not saying mass or taking confession, he could often be found in his overalls up a ladder! After recuperating for a number of years, he returned to the Cathedral in 2010. Monsignor Cookson plays an active part in the running of the Cathedral, and still presides over many services. Father Philip is from Bootle, and his home parish is Saint Benets, Netherton. He studied firstly in Valladolid in Spain, then at the Pontifical Beda College in Rome. Prior to going to seminary, Father Philip worked within the finance departments of several companies specialising in debt recovery and accounts management. Father Philip enjoys singing and playing guitar – he travels to Lourdes every year with the Archdiocese Music Group. Fr Stephen is chaplain to The Royal & Broadgreen Hospital Trust and The Liverpool Heart and Chest Hospital Trust . He was ordained at St Marie’s, Standish, in 2015 and joined the community of the Metropolitan Cathedral and Saint Vincent de Paul soon after. Before starting his studies for the priesthood Stephen was an IT technician at Salford University. Paul Mannings has been part of the Cathedral community since his student days in the 1970’s. He was ordained to the diaconate in 2008 and has served the Cathedral in that capacity since ordination. Paul’s work includes coordinating the Cathedral Guild of Guides. His wider Cathedral duties include ministry to the sick and housebound within our parish. He also assists with sacramental preparation for Baptism, First Reconciliation, Confirmation and First Eucharist. He oversees the process for the Rite of Christian Initiation of Adults (RCIA). In a professional capacity he is an advisor and inspector of Religious Education in our Catholic high schools and colleges. Paul’s hobbies include classical and modern languages. He loves to cycle and to make other spasmodic attempts to keep fit! Noel has been part of the Metropolitan Cathedral community since 1968 in various roles. He helped out in the Cathedral Bookshop in its early days, also assisting as an altar server on an ad hoc basis. He has also acted as impromptu steward, guide and security guard during the same time. Noel was ordained to the diaconate by Archbishop Derek Worlock in June 1993 and was originally involved in Baptism, Marriage Preparation and RCIA programmes. With the arrival of a young family, he later focussed more on liturgical aspects of Cathedral life. Deacon Noel also works as a hospital chaplain specialising in Mental health/ill health in various hospital units in South Liverpool. He ‘tinkers’ with technology and gadgets in his spare time and enjoys going to the Lake District, when he can fit this in with other commitments.